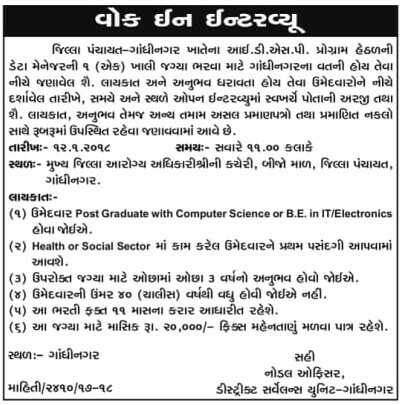 IDSP Gandhinagar has published Advertisement for below mentioned Posts 2018. Other details like age limit, educational qualification, selection process, application fee and how to apply are given below. Educational Qualification: Post Graduate with Computer Science or B.E. in IT/Electronics. Venue: Office of District Health Officer, Second Floor, District Panchayat, Gandhinagar.